Often high energy MVA, industrial accident with multiple injuries, crush injury, falls, sports-related. May be open with soft tissue injury such as degloving. indirect injuries result from twisting and axial loading of the extremely plantar-flexed foot. Natural history: withot anatomic reduction and fixation progressive pain and deformity develop. Pain, fatigue and instability are worse during the propulsive part of gait, especially walking up hills. Foot progressively abducts into valgus (turns out) with erosion of the dorsal and lateral apsects of the cuneiforms. Even the surgical treatment disabling pain and tarsometatarsal arthritis may develop. Can be homolateral(all metatarsals displaced in same direction), partial(one or more metatarsals displaced), divergent-metatarsal displaced in the sagittal or the coronal plane or both). 1st & 2nd MT-cuneifrom joints most commonly dislocated. Surgical exposure via one or more parallel dorsal longitudinal incisions over involved joints. Align the MT anatomically starting with the medial border of the first MT which should align with the medial border of the first cuneiform, once precise reduction is achieved a minimal incision is made 15-20 mm distal to joint and a 3.2mm drill is used from notch across base of MT into the body of the first cuneifrom. Can use 4.0mm screw(or mallelor, 3.5 cortical lag) to fix joint in slight compression. Typically moderate to severe swelling in forefoot, evaluate for open injuries / skin compromise. Tenderness of Lisfranc's joint. Passively dorsiflex toes. Severe pain in a tense swollen foot indicates compartment syndrome. If any concern for compartment syndrome, check compartment pressures. Absolute pressure >40mmHG indicates need for fasciotomy. 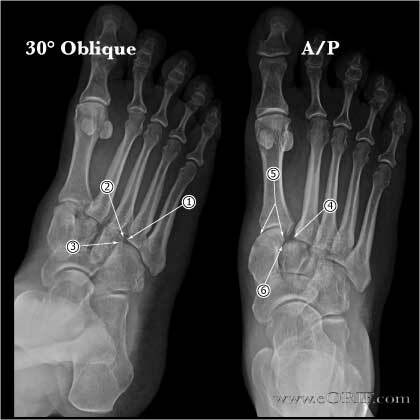 Xrays= a/p, lateral and 30° oblique standingviews of both feet. Most visible on A/P & 30° oblique views. Comparisions view of the normal foot are necessary, especially for pre-operative planning and intra-op comparisons. A/P view: medial border of second metatarsal is in line with medial border of middle cuneiform. 1st MT aligns with medial and lateral borders of medial cuneiform. 1st 2nd intermetatarsal space is continuous with the intertarsal space of the medial and middle cuneiforms. (Stein Foot Ankle 1983;3:286). Distance between 1st and 2nd MT bases up to 3mm considered normal (Coss, Foot Ankle Int 1998;19:537). 30 degree oblique: Medial border 4th MT in line with medial border cuboid. Lateral border of 3rd MT in line with lateral border of lateral cuneiform. 3rd 4th intermetatarsal space is continuous with intertarsal space of lateral cuneiform and cuboid. (Stein Foot Ankle 1983;3:286). Lateral view: should be uninterrupted line along the dorsal surface of the second tarsometatarsal joint. Dorsal displacement indicates Lisfranc injury. Up to1mm planter displacement may be normal. CT scan: intraarticular and osteochondral fx are often missed on xray and may leave fragments of bone and soft tissue in joint preventing closed reduction. (Haapamaki V, Foot Ankle Int 2004;25:614). 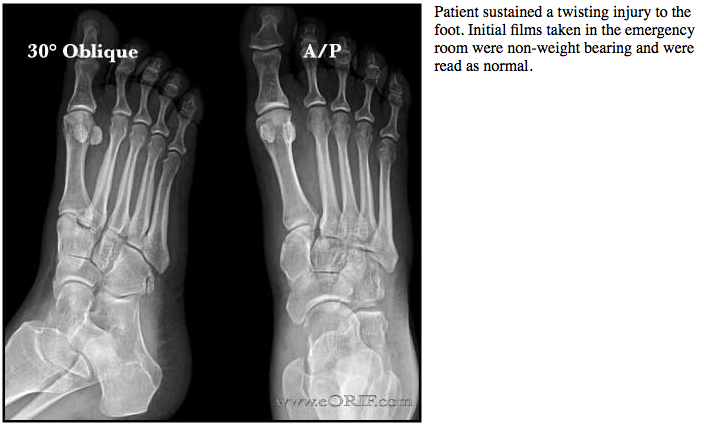 Acute Nondisplaced fx without ligament instability: NWB cast 6 wks. Cam walker x 6wks, no running/jumping for 3 months. Acute Displaced Lisfranc Fracture or with ligament instability (TMT joint displaced greater than 2mm): ORIF when swelling is at a minimum, immediately or after skin wrinkles return. Clinical outcome is directly correlated to adequacy of anatomic reduction. 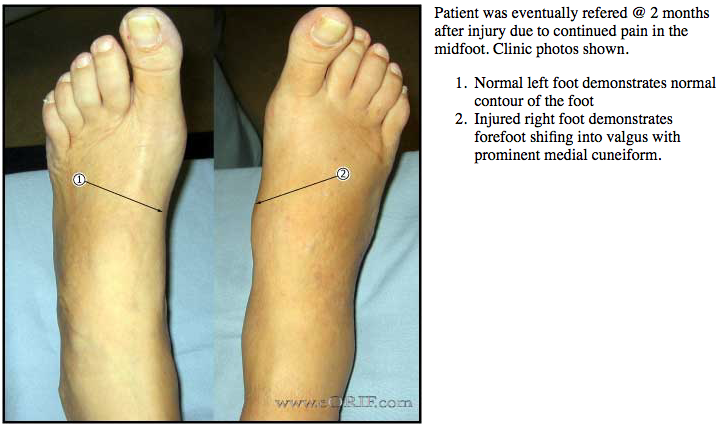 Acute Purely ligamentous Lisfranc Injury: primary arthrodesis of the medial two or three rays. (Ly TV, JBJS 2006;88:514), (Kuo RS, JBJS 2000:82A:1609). Clinical outcome is directly correlated to adequacy of anatomic reduction. Chronic injuries (>6weeks): realignment arthrodesis. Best known classification: Quenu and Kuss system which describes several common combinations of injury but neither rates severity nor indicates treatment/prognosis. Postraumatic deformity (usually planovalgus)with difficulty wearing shoes. Malunion (second tarsometatarsal joint dorsolateral angulation most common). 6 Weeks: Remove 4th,5th MT pins at 6-8 weeks. Place in cam-walker / fracture boot. Begin partial weight bearing at 10 weeks. Outcome measures: AOFAS midfoot score. Early restoration of joint congruity has improved outcomes over nonanatomic treatments. Brunet JA, Wiley JJ: The late results of tarsometatarsal joint injuries. J Bone Joint Surg 1987;69B:437-440. 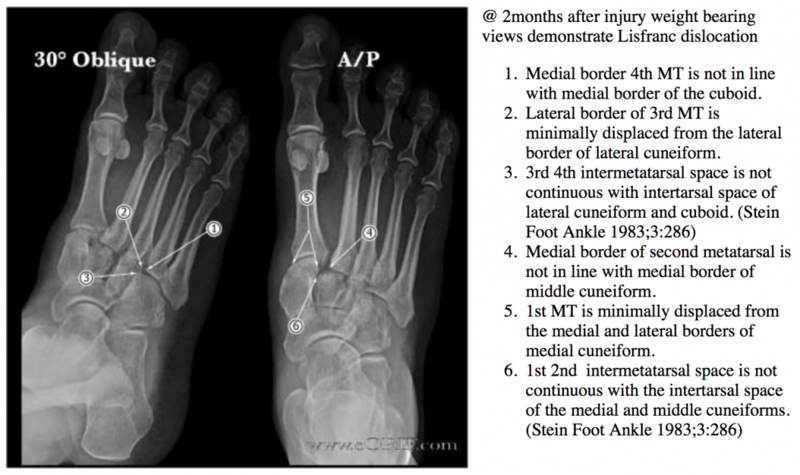 Brunet JA, Wiley JJ: The late results of tarsometatarsal joint injuries. J Bone Joint Surg 1987;69B:437-440. Rammelt S, Schneiders W, Schikore H, Holch M, Heineck J, Zwipp H. Primary open reduction and fixation compared with delayed corrective arthrodesis in the treatment of tarsometatarsal (Lisfranc) fracture dislocation. J Bone Joint Surg Br. 2008 Nov;90(11):1499-506. Desmond EA, Chou LB. 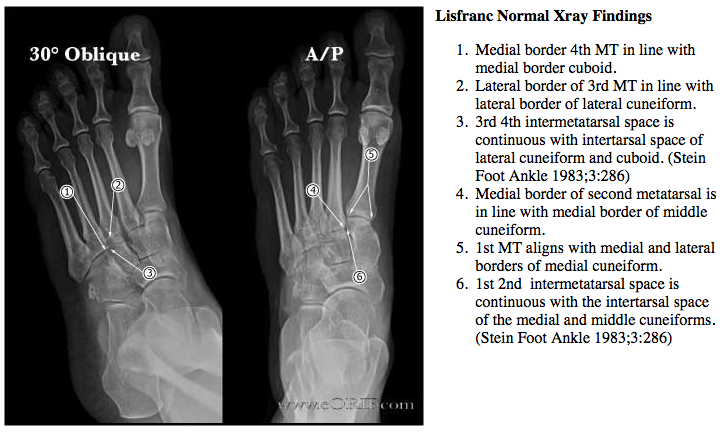 Current concepts review: Lisfranc injuries. Foot Ankle Int. 2006 Aug;27(8):653-60. Review. Watson TS, Shurnas PS, Denker J. Treatment of Lisfranc joint injury: current concepts. J Am Acad Orthop Surg. 2010 Dec;18(12):718-28.